Before food is even in sight, the brain prepares the body for digestion. The mere thought of food can trigger a release of chemicals in the stomach. The process of digestion then continues in the mouth, proceeding on into the stomach and then ending in the intestines. In the cephalic phase of digestion, the anticipation of food prepares the body for the digestion, absorption and use of nutrients in food, according to an article published in 2008 in “Appetite.” The sensory aspect of food, such as the sight and smell, influences eating behaviors. For example, the smell of a favorite dish can set the stage for overeating. This occurs as a result of the activation of the medulla oblongata by food-related sensory input. The medulla oblongata controls autonomic functions like heartbeat and respiration. 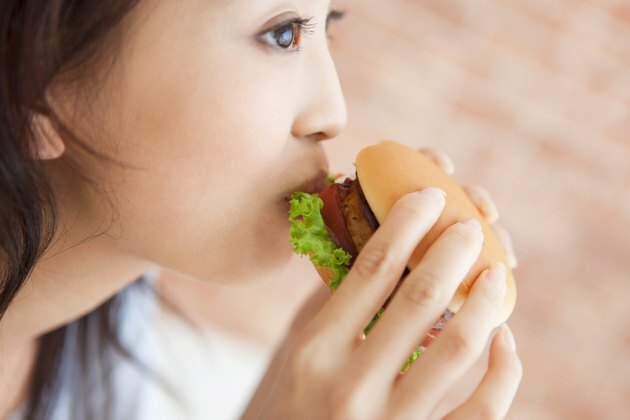 The feel of food in the mouth or thoughts related to food send signals to the medulla oblongata via the vagus nerve to stimulate the release of stomach chemicals, pepsin and hydrochloric acid, which play a role in the breakdown of food. The vagus nerve is the longest of the cranial nerves, or nerves originating in the brain, and extends through the abdomen. According to the researchers, this response is likely influenced by the orexigenic peptide ghrelin, which is a protein that is found mostly in the stomach but also exists in the brain. "Orexigenic" literally means, "appetite-stimulating." Ghrelin is capable of brain signal communication. Therefore, ghrelin is what stimulates appetite. Ghrelin also influences how much of the fat from food is absorbed into the body. The gastric phase of digestion begins when food enters the stomach, causing the stomach to extend. The stomach then continues to release the digestive chemicals hydrochloric acid and pepsin, first stimulated in the cephalic phase. This process helps to improve food intake and digestion, according to an article published in 2010 in the “Biological and Pharmaceutical Bulletin.” When food is in the stomach or mouth, the vago-vagal reflex communicates which nutrients, such as carbohydrates and protein components, are present. Based on the feedback, the required levels of digestive chemicals are released. There are taste receptors in the mouth that can detect which nutrients have been eaten. Stomach chemical secretion ceases once the intestinal phase of digestion begins. This action is initiated by the stretching of the duodenum and the secretion of the hormone enterogastrone. Enterogastrone controls stomach acid secretion primarily when fat reaches the duodenum, according to an article published in 2008 in “Contemporary Endocrinology.” The duodenum is a short piece of the small intestine that connects the stomach with the remainder of the small intestine. When this process occurs, appetite decreases in order to stop food consumption.